Outgoing Senior Warden Tom Savoth shares a quiet moment today before the service with his fellow Warden at St. George's Episcopal Church, Cheryl Notari. Note the aura of gravitas descending on Cheryl as she prepares to become the Senior Warden. Nearly nine decades ago some citizens of Maplewood, New Jersey came together in a spirit of faith and community to begin planning a major new Episcopal church on a wooded hillside off of Ridgewood Road. The parish traces its roots back to just after the Civil War, but the cornerstone for the current building was laid in 1925. Generations of Maplewoodians have enjoyed fellowship and sanctuary in the years that followed. The Web Goddess and I were married there in 2000, shortly after we became members, and we held our reception in the then-decrepit Parish Hall. Ten years later we stood up in the middle of a Sunday service to renew our vows in front of God and a community that has sustained us through some very difficult times. During that decade, the Web Goddess earned her moniker by teaching herself HTML, then building and launching the St. George’s website. She has lovingly maintained the site ever since, through two major redesigns, while honing her skills as a photographer. Virtually single-handedly she has built stgeorges-maplewood.org into what almost certainly is the largest website in the 108-parish Episcopal Diocese of Newark. The website marks its 10th anniversary this month, and if there is a larger, more robust, more professional church website built strictly on a volunteer basis anywhere in the country, I want to see it. Her online evangelism quickly led to an elected position as a member of the parish Vestry. When she stepped down because of term limits six years later, I stepped up. I’m now entering my fourth year as head of the Property Committee, a role that keeps me busy caring for an aging physical plant. Along the way we’ve both become full-time, professional Episcopalians — she as Director of Communications and Technology for the Diocese of Newark, and me as Parish Administrator of Grace Episcopal Church in Madison. My role as Property Poobah at St. George’s is what led to these musings, as today was our Annual Parish Meeting, a time of transition for several very dear friends. Tom Savoth stepped down as Senior Warden after seven years of Vestry service, including four years as Warden. 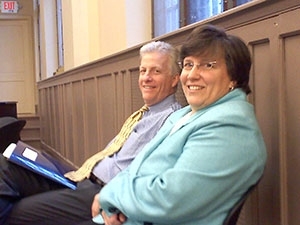 Joining Cheryl Notari as Warden is the newly elected Valyrie Laedlein, and they’ll work closely with the Rev. 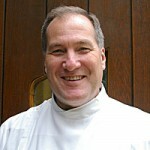 Bernie Poppe, who is only the seventh Rector in the church’s 106 years as a full-fledged parish of the Diocese of Newark. The Rector and Wardens oversee a small, mostly part-time staff and a legion of volunteers, some of whom have been attending services there for five decades or more. St. George’s is fortunate to have leaders of the quality of Bernie, Cheryl, Valyrie and Tom, and the Web Goddess and I are blessed to be able to call them friends. Our beautiful building is feeling its age, and I had the dubious honor today of telling the parish that I’ve spent $13,000 of their pledge money in the past five weeks making emergency repairs to the heating system. We’re not done — fortunately the temperature outside is in the 50s today, because while the church itself was overheated, there was no heat in the Parish Hall. The meeting marked the start of a parish-wide conversation about the heating system that will continue for many months, and much work will be done by many people. There’s time enough for that, and time for this blog to resume its normal fare of cranky political commentary. But once in a while I use this forum for a more personal message. Just for today I want to pause long enough to give thanks for a group of good Christian people in the 1920s, who looked at a wooded hillside and envisioned a church. Photos by Kirk Petersen (with a cellphone!) and the Web Goddess. This entry was posted in Uncategorized and tagged Episcopalian Issues, Maplewood, St. George's, Web Goddess by Kirk Petersen. Bookmark the permalink. What a nice article, Kirk! We’re blessed to have you and Nina as part of the parish! You did a great job at the meeting yesterday outlining not only the issues, but demonstrating the faith and commitment to address them. I meant to tell you yesterday how beautiful and moving your words were, “they looked at a hillside and envisioned a church…” Absolutely the right note to strike at the beginning of a discussion of how much of our money that building now eats. Thanks for your faith, for your love of St. George’s, and for all the work you’re stuck with doing. Elaine, it was a pep talk for myself as much as for the Parish 🙂 I’m glad you liked it.